By connecting your Windows 8 account with Facebook, you can perform a range of tasks in Facebook and get access to a lot of Facebook features to your Windows 8 desktop. If you are not using the Microsoft Account on your Windows 8 computer, read how to switch to Microsoft Account in Windows 8. 1. Share your photos to Facebook from People App. 2. View all Facebook photos in the People App. 3. Chat with your Facebook friends. 4. Add comments to posts or photos. 4. Connect to Facebook from all computers where you login using the same Microsoft Account. 5. 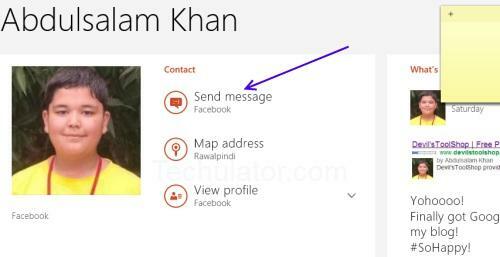 Update your Facebook status directly from the People App in Windows 8. 6. 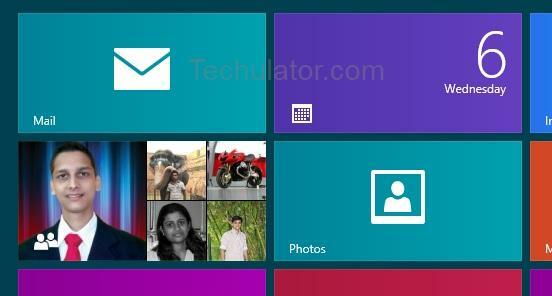 Get alerts and notifications from Facebook on your Windows 8 Metro Start screen through the People App icon. Once you connect your Windows 8 to Facebook, you can get all notifications from Facebook directly on your Desktop on the People App icon. People App will show the notifications through scrolling messages and pictures. 7. You can open the People App to get a lot more information on the notifications. How to start chat with a Facebook friend from People App? Find your friend on the "People" section. Click on the "Send Message" option to start a chat with the Facebook friend. You will see an option in the next screen that says 'Type Your Message'. Type your chat message there and click the smiley to send your message. NOTE: Currently there is no way to post a status message from People App to Facebook. You can only comment on other messages or photos. The ability to post status updates will be added to the People App in future releases. Is it safe to link Facebook with the Windows 8 People App? Just like any other online services, linking Facebook with People App also could have online security threats. Microsoft and Facebook should have taken all necessary precautions to protect your privacy and keep your data safe. To ensure your security, you will be able to access only a limited set of tasks from the People App. You will be asked to login directly to Facebook profile to perform some sensitive tasks. Windows 8 is currently under preview mode and is not a fully completed product. So, there could some security threats which are not yet detected by Microsoft.